The Ripon College Reserves Officer Training Corps (ROTC) program began in 1919. 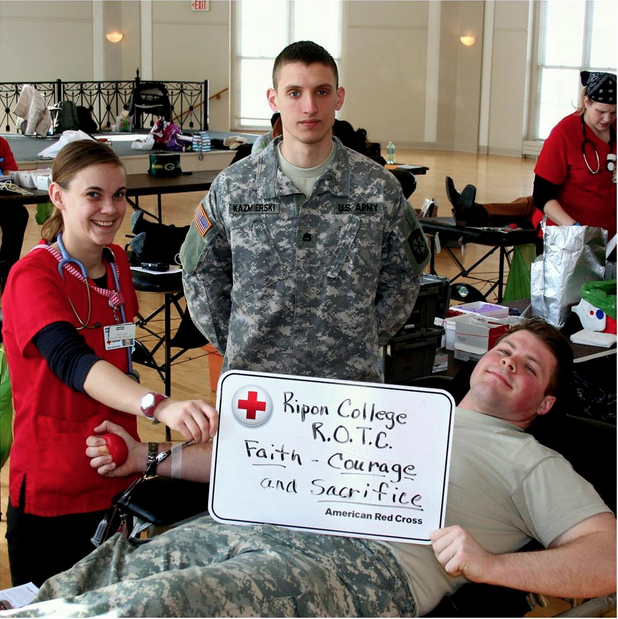 Military curriculum was already part of the experience at Ripon College, soon followed by the Student Army Training Corps (SATC) program. World War I placed national attention on the importance of military officer training programs but it wasn’t until World War II when the ROTC program was solidified at Ripon College. The Crimson editions of 1941, 1942, and 1943 dedicated more pages to the military than any other Ripon College yearbook and the ROTC program has maintained a strong presence on campus ever since. Ripon College along with UW-Oshkosh, St. Norbert College, UW-Green Bay, Lawrence University, and Marian University make up the number one ranked Fox Valley Battalion. To learn more about the Red Hawk Company and its role on campus I recently sat down for a chat with cadet Alex “Kaz” Kazmierski. The Red Hawk Company is involved in many off campus leadership and training experiences. They not only have classes and labs on campus, but they also have classes in Oshkosh with other members of the Battalion. Summers and weekends are frequently packed with training courses. Can you tell me about the Fort McCoy training you and other Ripon College ROTC members went through over a weekend training in October? We took classes for Land Navigation and Patrol Bases. Then we did a Land Navigation course with the first year cadets. We set up a patrol base. It’s a way to safely rest for the night. One third of the people have to stay awake to look for danger. It is a triangle of men. Then, the people in Ranger Challenge were told we had to do exercises. The exercise was a 12-mile ruck march beginning at about 11 p.m. After this, we went to bed, woke up at 5 a.m., and prepared for the first year cadets to take the Field Readers Reaction Course, Confidence Course, and Obstacle Course. The final rotation was a rappel tower, where Cadet Housten was contracted. When he was half down the tower he took his oath. Workouts at 6 a.m., labs and classes on Tuesdays and Thursdays, and Monday class in Oshkosh. What is the best aspect of the program for you? This is tough. The summer training. There are a lot of exercises to build cadets’ endurance and strength. Serve as a Second Lieutenant in the US Army and fly Blackhawks in a medivac. Has it changed you as a person in any way? I’m in a lot better shape. I came in weighing 210 pounds but currently I weigh 185. I started with a 240 on my Army Physical Fitness Test but now I have a 313. It alerted me to different cultural issues. I went to Hungary for a CULP Program (Cultural Understanding and Language Proficiency). It is humbling. It makes me grateful for the little things in life.